1. 10 " super power UP200 double core 200 W AC / DC battery balance charger discharger for Lilon LiHV nickel cadmium nickel hydrogen Pb RC battery. 2. 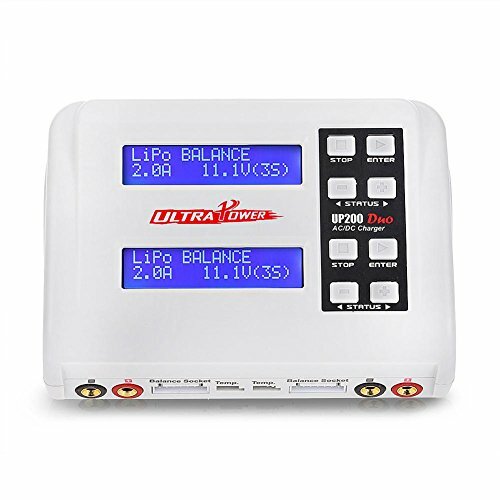 The super power 200 W UP200 two charger is an economical and high-quality 11-18V DC or 100-240 V AC dual balanced charger, which is used to recharge for Lilon LiHV, Ni Cd, Ni MH battery, and can charge two different batteries at the same time. 3. It can be supported in AC power distribution mode with total power of 100 W (CH1 + CH2 = 100 watts), and in DC mode, works 2 * 100 W.
1. Two-channel charge two different kinds of batteries simultaneously. 2. 11-18V DC or 100-240V AC dual input voltage. 4. Balancing individual cells for battery discharging. 5. Adaptable to various type of lithium battery. 6. Fast and storage mode of lithium battery. 8. Re-peak mode of NiMH/NiCD battery. 12. Automatic charging current limit. 13. Temperature Threshold (temperature probe is not included). Please read this entire operating manual completely and attentively before using. Two-channel charge two different kinds of batteries simultaneously. 11-18V DC or 100-240V AC dual input voltage. Package inckuded:1 x UP200 DUO 200W Balance Charger?1 x AC Charging Cable?4 x Charge Connecting Cable?1 x User Manual?